When people lose teeth because of extensive decay, injury or gum disease, smile gaps cause problems with eating, speech and personal appearance. 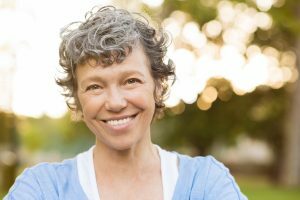 Dr. Mark M, Makram, implant and cosmetic dentist in Naples, FL, creates well-fitting and functioning dentures perfect for patient’s needs and preferences. Dentures in Naples replace missing teeth so patients have clear speech and ease of biting and chewing. Also, dentures create a more youthful facial appearance, reducing the skin wrinkling and facial sagging that typically come with tooth loss. Dr. Makram and his team evaluate patients for the right denture option. He uses oral examination, digital X-rays and intraoral camera imaging to visualize soft tissues, remaining teeth and underlying bone structure. He takes precise oral impressions so dentures have the most comfortable, functional and realistic fit possible. There are three basic kinds of dentures: partial dentures, immediate full dentures and conventional full dentures. Dr. Makram uses quality materials and great follow-up care to craft prosthetics well-suited to personal preference and need. Partial dentures replace one or multiple teeth. Made from tooth-colored, durable materials, artificial teeth are mounted on a light metal frame. The frame attaches to neighboring natural teeth with small clasps. “Partials” are removable and last for years with good at-home care and check-ups with Dr. Makram. Immediate full dentures replace a full arch of teeth. Dr. Makram places them right after tooth extraction. The dentist takes oral impressions before tooth extraction, and a trusted dental lab makes the dentures before the dentist extracts the teeth. Right after extraction and suturing, the doctor places the new denture. There are a couple of advantages to the process: first, the patient leaves the office with a complete set of teeth, and second, the prosthetic places pressure on the extraction sites, stopping bleeding and facilitating healing. However, as time goes on, gums and bone shrink, changing the fit of the immediate denture. So, the denture must be relined or replaced to ensure good functionality and aesthetics. Conventional dentures replace a complete arch of teeth on the top or bottom. Unlike immediate dentures, the extraction sites heal for several weeks before Dr. Makram places the prosthetic teeth. While this allows the denture to fit properly right away when placed, the patient does not have teeth to wear during the healing process. Implant-supported dentures provide superior fit and function because they are supported by multiple dental implants. Inserted directly into the jaw, dental implants meld with the bone, keeping a partial or full denture steady and strengthening the bone, too. With any new prosthetic, patients must adjust, and learning to eat and speak with their artificial teeth takes some time. With practice, results are very good, and Dr. Makram and his professional team are available to address concerns and work with the fit of the denture. Patients should expect to see the dentist several times over the months immediately following new denture placement. Dr. Makram graduated from the well-respected Misch International Institute. His skills are well-developed and can be safely trusted to produce excellent results for your oral health. You’ll have excellent health and oral function with precisely crafted dentures from Dr. Mark M. Makram. Contact his office for a personal consultation.